I had purchased some pencil roving in white and grey/black from Woolery. This was a great medium to begin my spinning with. Most articles that you read and YouTube videos that you watch, Craft Daily videos, etc, will recommend that you begin by getting a feel for your wheel and just treadling for a while to see how little effort it can take to get your wheel going and keep it going. This is great advice, that I did not take. After assembling my wheel I dove right in. I had this pencil roving sitting around from a previous attempt at a project. It is, to be frank, outerwear roving. 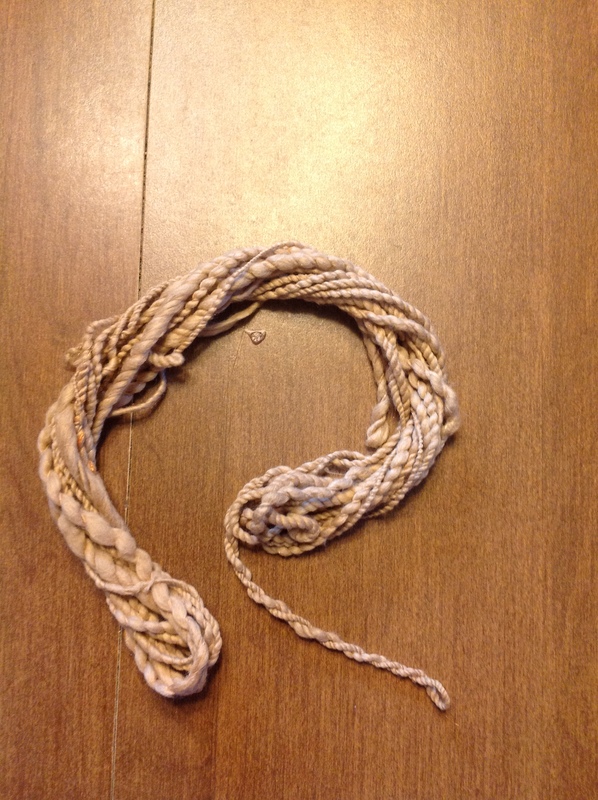 Now that it is spun up and in a 3 ply I will have to figure out a project that I can use it for. Since it is so rough I would rather not make it into a scarf, but I might try weaving with it to see if I can make some kind of warm outer shawl with it. I really enjoyed working with this roving and my new wheel. It is truly amazing how little effort it takes to keep the wheel spinning and how little twist needs to be put into this roving to keep it together. This is unwashed, there was a third skein but it was my first time using my new Lazy Kate and I didn’t do a very good job keeping the strands separate. There are pigtails everywhere, even a couple of big globs of pigtails. If you never do anything wrong, then you are never doing anything! Happy Spinning (the other skein might make it into a blooper reel I am not sure yet). Honestly there are so many different accessories available for spinning wheels it gets a bit overwhelming at times. The best way I am finding to narrow things down is to remind myself what kinds of yarns I like to work with. In looking at the different wheels I became dismayed that none of the double drive wheels have a jumbo flyer with an orifice of more than 1″. But wait a second, the flyers of more than 1″ are for making those big funky artsy yarns….I hate knitting and crocheting with those kinds of yarns, so why would I want to make them? Keeping considerations like that in mind allow me to remain happy with my choice of a double drive wheel while also being able to choose the accessories that will work well for me. Niddy Noddy- this will allow me to keep my skeins organized and tidy, as I get better I will want to know at least approximately how big they are so this will help with that also. Yarn Swift- Once I know how big they are I will want to roll them into balls, I already have a center pull ball winder I love so a Yarn Swift is probably going to be my next purchase. It will allow me to use the ball winder without the tangles I am currently getting. Lazy Kate- this will allow me to ply my yarns without tangles and while they are tensioned. A few of the wheels I am looking at have integrated Lazy Kates, but some reviews have indicated trouble when you have to pull the threads forward from the Lazy Kate then allow them to ply. It would make more sense to have the Lazy Kate on the floor a big away from the wheel. There seem to be two kinds, vertical and horizontal (arched). I am looking at the arched version simply because I can see the entire thing toppling over if the yarn (I keep thinking of it as thread but it really is considered yarn) on the top is somehow heavier than the ones on the bottom. Hand Carders- Okay, so this comes down to, I have a long haired cat. I brush her constantly and she sheds a ton. Recently I decided to keep this fur and see if I can make something from it, a bracelet or the like. To have the fiber in a shape where I can use it to spin I can either comb it (big sharp tines) or I can card it. I think that carding will have fewer chances that I will stab myself with the really big tines, so I am going to start with that! Blending Board- I have some beautiful Bamboo fibers that I bought way back when. While I might be able to spin them with the Spindolyn, odds are I am going to want to blend them with wool to create wonderful Rolags I can spin into a wonderful blended yarn. This is also a great way to experiment with color and create my own rolags, I also have some flashing so I can add sparkle. Yay! Okay, so these boards cost almost $200, it is probably something that will wait a while. There are a ton of different options for all of these devices. For the most part I will get the best quality that my budget allows. For the yarn swift there is one on amazon that looks to be adjustable and of good quality for a very low price, I will ‘cheap-out’ and purchase that one. Also for the ‘Niddy Noddy’ since I do not plan on using it to display yarns and only intend to have it as a functional piece I will ‘cheap-out’ on it as well and get a version made of PVC pipe. Yes, in theory I can make this myself but for almost a cheap as the PVC pipe I can avoid the risks of cutting myself and buy it pre-made. These are a lot of accessories when I haven’t even bought the wheel yet! Most of them are usable before I have purchased my wheel, it might be nice to see how large some of my spun silk singles wound up being. If I decide to make some yarn as a double or try to triple ply then the Lazy Kate will come in handy, once I have some yarn on the Niddy Noddy then the yarn swift will come in handy to use the ball winder. Essentially these small steps all go toward the goal of having what I need to make the yarn I want. If I can take some of these small steps without compromising the goal of saving toward my spinning wheel then so much the better. It is a better thing to do to buy a small device than lose hope on obtaining the large! This was my first attempt at plying. I do not know what the fiber is (really soft 2″ staple) though I suspect it is some kind of wool or cotton (I know how do I make these huge leaps). I know it isn’t bamboo because I have some of that and need to look into getting blending board because it is too slick for me on its own. I think that the plying went well, without a lazy kate, and look forward to making this into something. Anything. Probably vaguely bracelet like so I can wear it! Finally a fiber I can Identify! While looking for some magnets for a project of my mother’s I found some old silk ‘hankies’ I had purchased to spin. 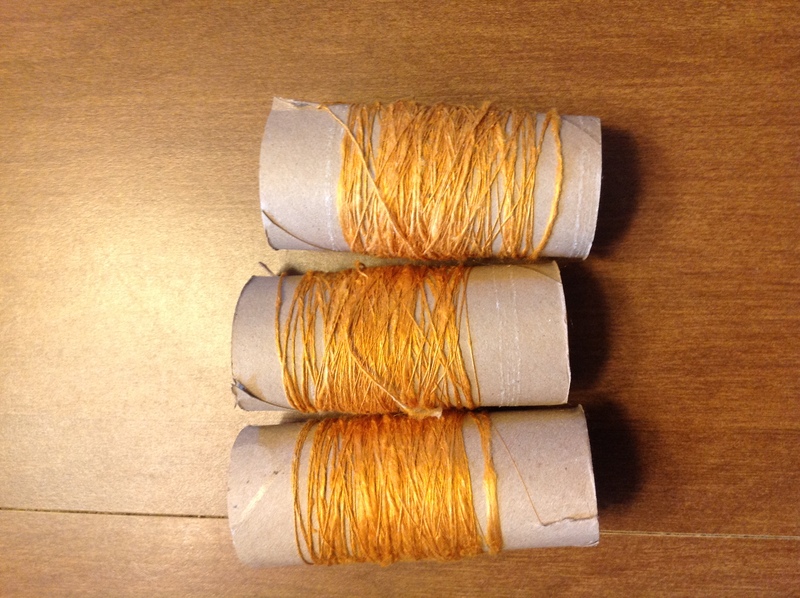 It was a blast spinning these yellow/gold ones into threads and after they have rested I look forward to plying them. Yes, I’m still working with Toilet paper roll centers. they work really well! Okay, so I don’t have a Lazy Kate either, I managed to ply a 2 ply yarn without it, so I hope this goes well!